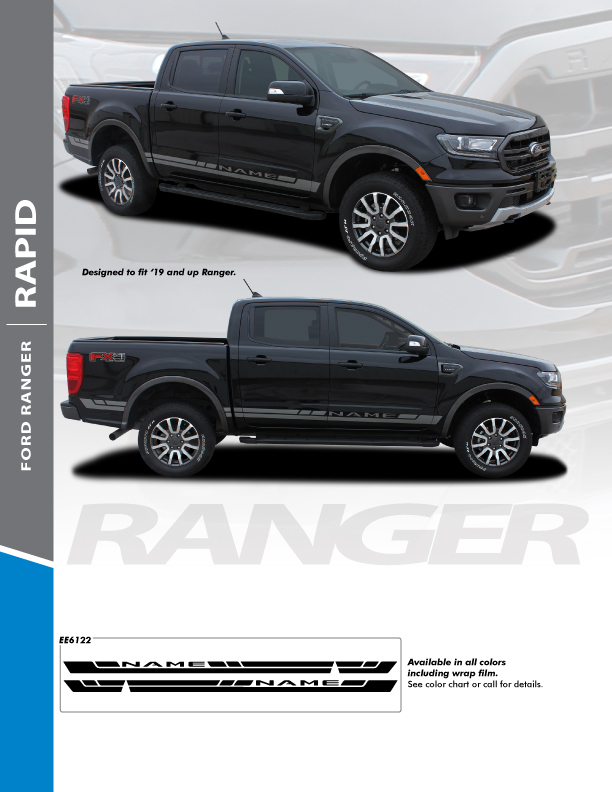 The RAPID ROCKER WITH RANGER NAME KIT for the 2019 2020 Ford Ranger from Ray's Auto Trim are awesome looking and in stock! We all remember this Classic Truck and NOW Ford has brought it back and they really did an Awesome Job and these Ford Ranger Decal Stripes can really add that finishing touch! Upgrade today for 2019 Ford Ranger Side Stripes from Ray's Auto Trim. We can take your order for 2019 Ford Ranger Side Decals over the phone. We can supply you with the highest quality, OEM style Ford Ranger Vinyl Graphics and Ford Ranger Decals available and these kits can be installed straight out of the box. Ray's Auto Trim is simply the best when it comes to precision cut Ford Ranger Stripes, Ford Ranger Decals and Ford Ranger Vinyl Graphics. TEXT or Call Us Today!